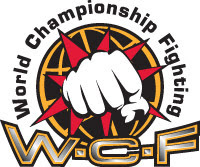 World Championship Fighting® Returns To Boston!!! The action comes to you live Friday, February 8, 2008 at the Aleppo Shriners Auditorium in Wilmington, Mass. In attendance will be our very special guest and President of the UFC Dana White! More fights for this event to be announced soon! Special Guests expected in Attendance: UFC President: Dana White, UFC Fighters: Marcus "The Irish Handgrenade" Davis; Kenny "KenFlo" Florian; Sean "The Gladiator" Gannon; Jorge "El Conquistador" Rivera; Pride Fighting Veteran Murilo "Ninja" Rua; Muay Thai Coach Mark DellaGrotte "The Ultimate Fighter 4"; Boxing Coach Peter Welsh "The Ultimate Fighter 2." Or charge by phone at: 1-800-595-4849 Toll Free. 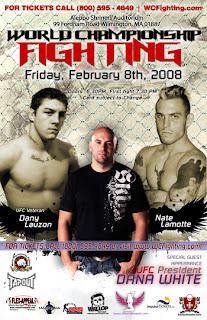 For additional information on this event, visit WCFighting.com or contact info@wcfighting.com.